Self-Cleaning Condenser - The accumulation of dust in the condenser can cause the failure or breakdown of refrigerators. Refrigerators run normally until they reach a certain level of accumulation. At some point, when they are over the limit, their performance drops quickly resulting in damage to, or disposal of the stored products inside. The Self-Cleaning Condenser device keeps the condenser clean and prevents system failure by automatically brushing daily. and have very low contribution to global warming (ODP-0, GWP-3). top and the rear. This unique air flow creates a cold air-shield around the pan, which maintains the food temperature at under 41°F (NSF requirement) even when the lids are opened. 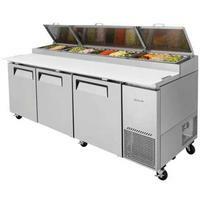 In addition, the compartment isolates pans from the reach-in area to prevent food spillage. Stainless steel cabinet construction - The Turbo Air Super Deluxe model boasts a stainless steel interior (ABS door liner) and exterior (galvanized steel back & bottom). It guarantees the utmost in cleanliness and long product life. The Super Deluxe adds a touch of style to the most refined setting. Deluxe series uniquely provides stainless steel shelving. Density Polyethylene). The new side rail cutting board bracket makes it easy to secure and remove the cutting board. High-density polyurethane insulation - The entire cabinet structure and solid doors are foamed-in-place using high density, CFC free polyurethane insulation.